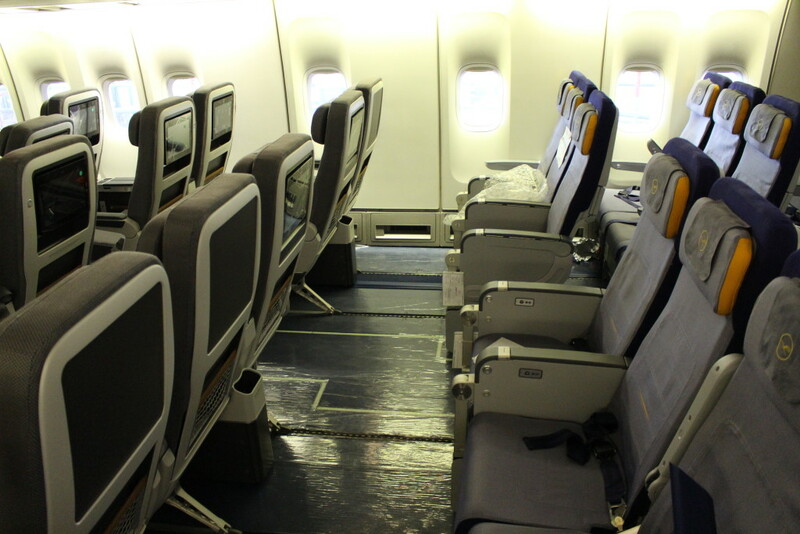 Having received regulatory approval to install its new premium economy seats while refurbishing its older Boeing 747-400 aircraft, Lufthansa is in full flow with the refits. Runway Girl Network recently toured D-AVBM in mid-modification, poring over all the details of the refit configuration and how it’s starting to come together on board the aircraft. First up — or, technically, out — is first class, which has been removed entirely from the 747-400 fleet as these older aircraft enter their last phase of life. It’s farewell to the unique Lufthansa 747-400 upper deck first class product with its separate seat and bed, a notably popular combo among passengers with the money (or miles) to spend on it. Interestingly, that cabin only lasted four years, since the refit of the old “corrugated” blue first class seats in 2011. 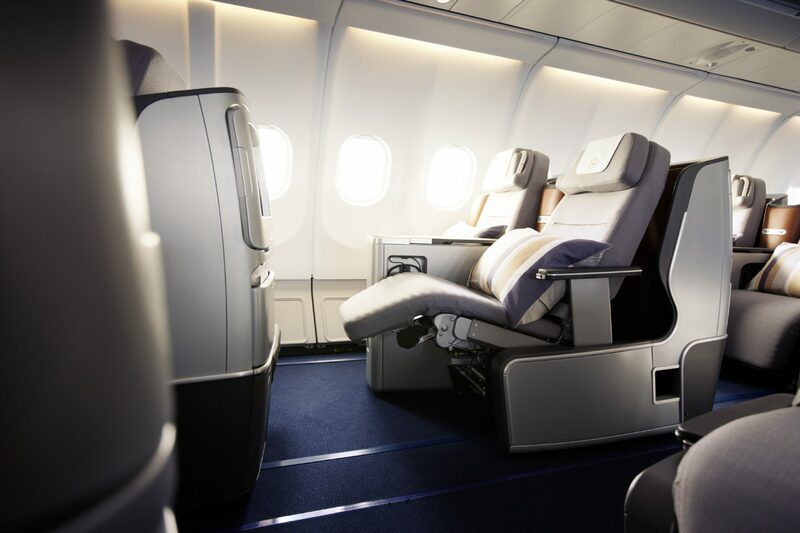 Now, in their place, comes the latest version of Lufthansa’s fully flat business class seat — a product more similar to those old blue seats than today’s first class. 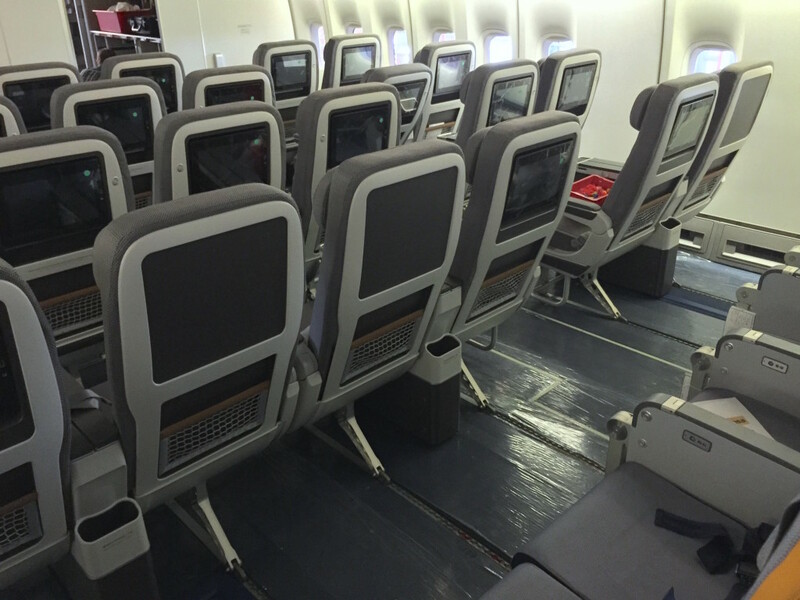 Business class spreads across the upper deck, in the nose cabin and in the first cabin on the main deck. That latter cabin is the only one to see the much-derided “V” version of the seats, much-derided as “footsie class”, which has two seats pointing towards each other, meeting at the footwell and separated only by a relatively flimsy centimetre-thick divider. A game of footsie anyone? All other business seats on the aircraft are in the “H” version, where seats point in the same direction and each has its own separate cubby section. 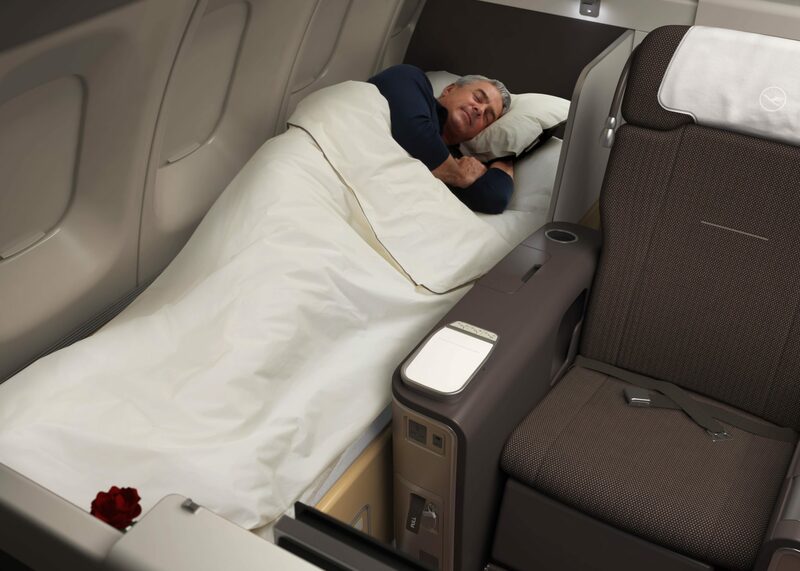 An added benefit: it’s significantly easier for window and middle seat passengers to get out now, since there’s a gap between the two seats to put a foot on the floor in order to elegantly pick their way (or ponderously lumber) over the sleeping passenger. But the return of the middle seat — which Runway Girl Network reported last October will not be a popular move by Lufthansa. Its configuration isn’t shaped like any letter (not even the Russian ж), but it’s a combination of the two existing layouts. These trios of seats take up the space of just two seats on the 747-8, and it’s not clear why Lufthansa decided to add middle seats back into the mix. Questionably popular also will be the row 1 set of four seats, which curves around a slightly convex shape and looks rather like four pairs of feet are all playing footsie together. Behind business class — most of the time — sits premium economy, which has just received its supplemental type certification on the 747-400. Indeed, D-ABVM, the aircraft we toured, is just the second to have the new cabin installed. It’s the same ZIM premium economy seat as in the rest of the fleet, arranged in the same 2-4-2 configuration as on the 747-8 and A380, although the entertainment system is the Zodiac RAVE that is installed elsewhere on the 747-400. 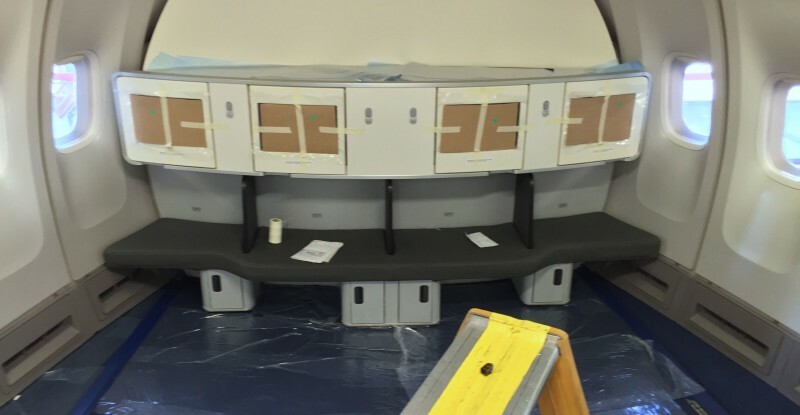 Interestingly, despite the seat map clearly showing some sort of divider between the premium economy and economy sections, no such barrier was evident, and Lufthansa Technik staffers told us that this part of the cabin was finished. Oddly, that gives an incredible amount of room for the first row of economy behind the premium economy seats, apparently with the intention of handing them out to top-tier frequent flyers. Of note is that the monitors attached to the rear row of premium economy are not for the passengers in the front row of economy. Rather, these are hot-swappable RAVE devices in case of issues with premium economy screens, with the economy passengers’ monitors contained in the swing-up arms usually seen in bulkhead and exit rows. Economy sees newer full featured slimline economy seats with significantly sculpted knee space. 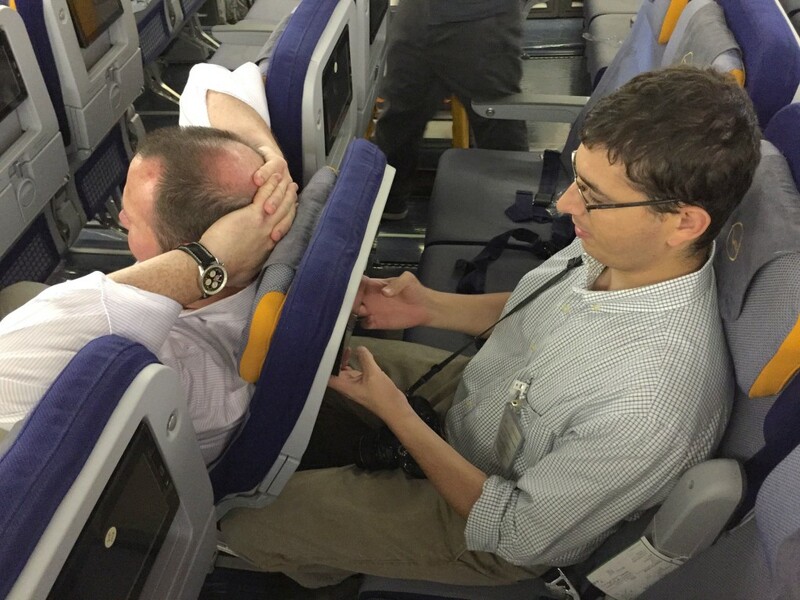 Given LH’s 31” standard, this is a real comfort improvement, although the usual recline claustrophobia issue at this sort of pitch is still present — as RGN contributor Jason Rabinowitz and AirlineReporter’s David Parker Brown demonstrate clearly below. All in all, the refurbishment is a plus, with seats that are now suitable for the current generation of passenger segments — but it’s always a shame to see less than elegant solutions to problems of an airline’s own making. The refits are understood to now be complete. So LH carries extra weight around in case the monitors fail? Is the RAVE system that much unreliable? Across entire cabin that must equate to 40-50 lbs. LH business class is one of the worst in the business. You wonder how the so “smart” Germans could come up with such a crappy product. Agree with Jo.,Lufthansa’s business class is crappy at best. As not all seats are aisle accessible they still even add a middle seat to the middle row..how insane is that? Would avoid them every chance I can as it really dampers the “premium” experience. I just did a long haul flight on this airplane with Lufthansa in economy class and had a claustrophobic panic attack when the person in front reclined his chair at the beginning of the trip. Reclining my own chair did not help much either. I splashed cold water on my face, took off my suit jacket, shut my eyes and listened to a relaxation recording for 6 hours and I refused all meals. What a nightmare – I will never ever fly in a 747 again. The outbound trip was in a 777 and that was fine. Hi, this has nothing to do with the 747. In fact a 777 could be worse as it is smaller therefor less roomy! Which airline did you fly with on the 777? Lufthansa does not operate that aircraft. It has nothing to do with the plane, more so with the operator.